With two weeks to go before the grand opening of its Family Store in Gala Plaza, Salvation Army of Greater Rome staff and volunteers are pushing to stock the shelves and fill the racks in its new space. March 21, 2017 (ROME, GA) -The Salvation Army is celebrating 130 years of service in Rome this year as well as the organization’s mission of hope, which is spread through its volunteers and workers. During a dinner and awards ceremony at Berry College’s Krannert Center Monday evening, workers, volunteers and donors gathered together to honor the volunteers, bell ringers and community partners that help the Salvation Army do its work. The group honored the Bell Ringer of the Year for the greatest number of hours served during the Christmas 2016 Kettle campaign, which was Berry College’s athletic department. The Rome-Floyd County Fire Department received the Bell Ringer’s award for most money raised, with more than $11,000 raised in four days. Michelle Dyer received the Volunteer of the Year award and Berry College received the award for Community Impact Partner of the Year. Volunteer Kala Bartley told the crowd her time with the Salvation Army has helped her grow spiritually and inspired her to go to college and get a degree in arts education so she can return to the Army to participate in the children’s arts program the Army sponsors. David Lively, who works at The Salvation Army as the kitchen manager, spoke about how his time at the Army helped him learn a few things about love. Lively said after McClure told him that, he attended a Bible study at the Salvation Army and was told about how good Christians loved everyone. Lively said the next time he saw McClure, he told him he loved him. Lt. Col. William Mockabee, the program secretary of The Salvation Army, U.S. Southern Territory, delivered the keynote speech. Mockabee explained that Gen. William Booth, the founder of The Salvation Army, launched a war, and that is why he needed an army. February 12, 2017 (ROME, GA) – Boy Scouts from more than a dozen units in Floyd, Polk and Chattooga counties collected more than 4,300 pounds of food from residents in their counties Saturday. The Floyd County units contributed their food to The Salvation Army for the first time this year. “This has already become a fantastic relationship,” said Jeff Brasher, Northwest Georgia Council of Boy Scouts of America executive. Scouts in the Cedartown units collected food for the Samaritan’s Purse Food Pantry, Rockmart area Scouts brought their food to the Rockmart First United Methodist Church Food Pantry, while the food Chattooga Scouts took in is being distributed by the Division of Family and Children Services in Summerville. A dozen or more members of the Rome Rotary Club also got involved in the sorting and warehousing of food collected during the Scouting for Food campaign Saturday. Rome’s Salvation Army Captain Jason Smith said the program Saturday really helps the Salvation Army to continue its monthly food assistance program. Scouting for Food coordinator Mary Hardin Thornton said that in past years, the Scouts have typically collected between 3,000 and 4,000 pounds of food during the annual effort. Smith said approximately 50 families in the Rome area receive the bags of groceries each month. The families are vetted for need by caseworkers that consider family finances and then make an assessment of need. Scouts fanned out across their home communities with door hangers promoting the drive on Feb. 4, and followed up the effort Saturday, going back through neighborhoods collecting cans. They then spent a couple of hours at The Salvation Army collecting cans from people who drove in with donations. ATLANTA, GA (December 2, 2016) – Can-a-thon 2016 skyrocketed over its goals for the year on Friday with a collection of more than 280,000 cans at four metro Atlanta locations. Locals and organizations alike turned out to donate canned goods at Turner Field, Cumberland Mall, the Infinite Energy Arena in Gwinnett County and the Forum in Rome. The goal was to fill the Salvation Army shelves with enough food to feed metro Atlanta families in need for an entire year. Thousands came out from schools, community groups, civic organizations and even individually to contribute – all with the same objective. “The only thing that means anything in this lifetime is doing something for somebody else,” said one contributor dropping off canned foods. For some, like the sixth grade students at Elm Street Elementary in Rome, Ga., it meant giving up a lot. “I had to give up my allowance to go shopping to get the cans,” said one student. The school came on a Rome school bus to be a part of the event. “I gave up my birthday money in order to get the cans,” another student said. The 11Alive Can-a-thon, which was a joint effort with Publix, brings a special blessing for families in need by way of the Salvation Army. The very process brings the best out in people said Salvation Army Captain Jason Smith. “You see charity at its best. You see the smiles on these kids. You see them work sorting these cans and that’s what it’s all about,” he said. In the end, it’s about looking after each other – and this year that’s just what happened – full pantries to feed thousands in need. ROME, GA (November 30, 2016) – Hundreds of volunteers will unload thousands of cans of food Friday as the Salvation Army holds its largest event of the year — the Can-a-thon. The Can-a-thon is the only food drive the Salvation Army holds and it nets enough food to last most of the year, according to Salvation Army Capt. Jason Smith. “This drive sustains our food pantry for about 10 months,” Smith said. Last year, the drive gathered 68,531 cans and other nonperishable food items. The drive will be at The Forum, 301 Tribune St., from 7 a.m. to 1 p.m. Friday. Volunteers are still needed to help out, Smith said. If anyone wants to volunteer, they may come to the event when they can or call the Salvation Army at 706-291-4745. “We usually get a major rush around 10 a.m., when the schools start dropping off cans they’ve collected, but any time people can come would be great,” Smith said. If someone wants to donate, all non-perishables are welcome, he added. Peanut butter, rice, spaghetti, canned meat, box dinners such as Hamburger Helper, instant mashed potatoes and items with pop-tops are especially helpful. The majority of the food goes to the pantry that helps sustain the grocery assistance program, which provides emergency assistance to people who need it. Those who receive the bags get enough food to feed a family for a week, Smith said. Food also is used to fill Christmas bags for senior citizens. About 85 percent of the donations come from schools, but anyone is welcome to come by and donate. Volunteers will show people where to drive and will come to the cars to unload items, if necessary. All of the food stays in Rome and Floyd County, he added. Rome’s Salvation Army Corps has new captains in Jason and Melissa Smith, who along with their two children, Jadon, 7, and Hannah, 4, are finding Rome to be quite the welcoming community. Hannah goes out of her way to take on projects and opportunities to enrich the lives of OTHERS. She is a real hero! Over the past two years, Hannah has organized a canned food drive for the food pantry, helped to organize a group to help with the Run for the Homeless 5K, prepared food for the Rome Community Christmas Eve Dinner, served food for various meals at the Rome Salvation Army shelter, and participated in the Christmas party for shelter guests. She has been busy! With Hannah, it is always about OTHERS. She looks for ways to make the lives of others richer and fuller. 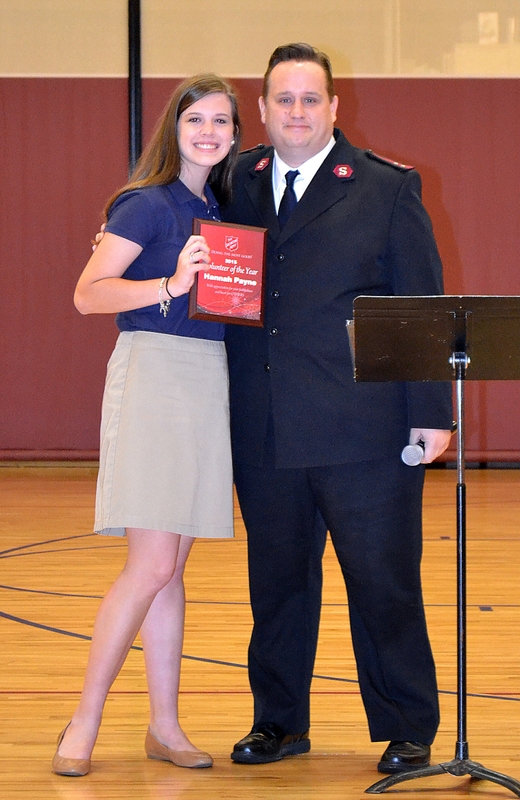 During the presentation, Captain McClure said, “Hannah, you spend so much time making sure other people get noticed, but today, all of the fingers are pointing at you, kid!” We are grateful for Hannah’s ministry and service through The Salvation Army and look for her to do amazing things in the future. “We love her great big heart and we are thankful that the Lord allowed others to enjoy it too. She is a blessing to us” said Hannah’s mother, Sherie Payne.